Li Chen was born in 1963 in Taiwan. 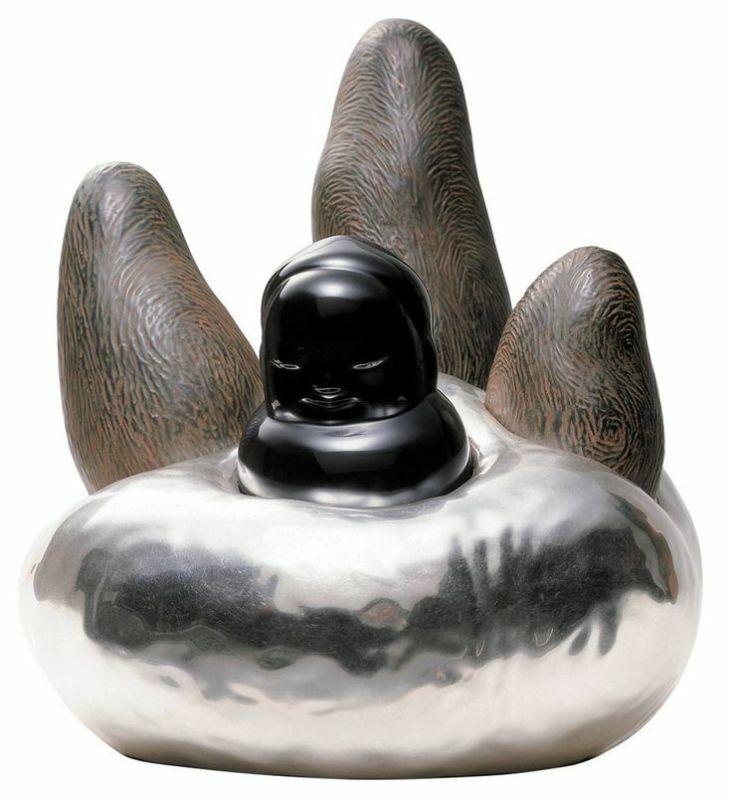 By incorporating feelings of self-mindfulness and interpretations of Chinese classics from Buddhist and Taoist traditions, blended with contemporary thought, he relinquished the pursuit of the industrial design arts to engage in pure artistic creation, accomplishing a style which fully liberated itself from the confines of tradition, evincing a remarkably refreshing and natural affect. Li Chen’s profound understanding of the human condition ripples throughout the rich depth of his Zen works with their spirit of childlike innocence and unambiguous joy. He believes that life involves loss only in consequence of alienation, as the dust of regret silently accumulates in the corners of the soul, and the work aspires to a kind of spiritual arts therapy, uncovering a wealth of joy amidst simple life’s pleasures and innovating a spiritual space through the pieces. As humour embellishes a metaphorical engagement with the world, he hopes to share this consciousness with the viewer as they appreciate the spiritual elements informing these creations. Li Chen’s spiritual sculptures evoke the subtle skill of the textile weaver in supple, almost mylar balloon-like textures, eliciting the softness within. He relies on the unique techniques of traditional Chinese ink lacquering together with gold and silver leaf, revealing a light and utterly relaxed self and animating a miraculous contrast via its “heavy yet light” presence. Chen Li’s signature aesthetic void exudes an exuberantly humane spirit and intimacy. In our unsteady era of uncertainty, Li Chen’s works achieve a harmonious sense of presence from impresence, with the Buddhist sense of a necessary absence and the Taoist commitment to instilling one’s vital Qi, replete with the visual semiotic richness of the contemporary arts, to successfully bridge the otherwise alienating cultural distance of the orient and occident, while pulling on the heartstrings with his playful sculpted lullabies. In 1999, Li Chen had his artwork debut in Taipei. Since 2000, his world tour exhibition started from New York to Chicago, Jerusalem, Copenhagen, Miami, Paris, London, Beijing, Shanghai, Geneva, Singapore, Seoul, etc. In 2007, he became the first Chinese artist to give a solo exhibition in the Venice Biennale. In 2008, his work was recognized at a major solo exhibition at the National Art Museum of China in Beijing. In 2009, Singapore Art Museum invited him to have his first solo outdoor sculpture exhibition. In 2011 when ultramarathon runner Kevin Yi-jie Lin reached the destination Xi'an in the expedition of “Running the Silk Road”, he lighted up the candle in the hand of Li Chen’s artwork “The Pursuer”. Li Chen, who has not held any exhibitions in Taiwan for ten years, continues exploring the possibility of making sculpture with the new spirit of the East. In 2011, he gave his exhibition Greatness of Spirit: Li Chen Premiere Sculpture Exhibition in Taiwan at the Road of Democracy and the Main Plaza at CKS Memorial Hall, kicking off the largest-scale sculpture exhibition ever in Asia to present Li Chen’s fruitful 12-year creation of Taiwan’s landmark to show the perfect combination between the spirit of the orient and contemporary vision. In 2012, Li Chen launched his first museum exhibition in USA titled LI CHEN: Eternity and Commoner at Frye Art Museum, Seattle.